The term tinnitus is derived from the Latin word “tinnire,” meaning “to ring”. “Tinnitus is a perception of sound, which is not produced intentionally, and it originates in an involuntary manner in the head of its owner, or may appear to him to do so”. Almost everyone has experienced a short, faint, and ringing in the ears at some time or other. It creates direct impact on a person’s emotion, hearing, and ability to sleep and to concentrateinfluencing basic life functions, such as socialization and relaxation. In International Classification of Function, Disability and Health (ICF 2001) tinnitus is coded as a separate condition and is defined as a ‘sensation of low-pitched rushing, hissing, or ringing in the ears.’ Classification of tinnitus helps in the process of diagnosis and selecting the optimal treatment option for the disorder. Tinnitus has been classified into two broad categories namely subjective and objective tinnitus. Objective tinnitus is audible to any one in addition to the affected individual which is associated with different vascular aetiologies, muscular spasms and eustachian tube dysfunction . On the other hand, subjective tinnitus is not associated with any physical noise and is only audible to the affected individual and it is referred to as “head noise” . The prevalence of tinnitus increases with age and found to be more prevalent in men than the women . Approximately 17% of the world, and 4 crore odd in India population has been troubled by tinnitus. The severity of the tinnitus can be assessed by psycho acoustically method by using some steps . That’s identification of the tinnitus ear (in this step the client having tinnitus have to identify in which ear the tinnitus is present), Understanding of the terms “loudness” and “pitch” (in this step, the audiologist have to demonstrate about what is the meaning of loudness and what is the meaning of pitch), Pitch Matching (in this step, the client have to match the pitch of tinnitus signal with the signal of audiometer), Loudness Matching (in this step, the client have to match the loudness of tinnitus with the loudness of the matched pitch produced by audiometer). Dauman and Tyler in 1992 proposed a psychological model of tinnitus in which the overall impact of tinnitus is influenced by the characteristics of the tinnitus (pitch, loudness, and quality) and the psychological makeup of the individual. It was suggested that treatments that are aimed at reducing reactions to tinnitus should use questionnaire, whereas treatments aimed at reducing the magnitude of the tinnitus should focus on tinnitus measures (loudness and masking). everal questionnaires have now been developed to document the handicapping nature of tinnitus and to measure change in clinical trials [7,8]. Tinnitus questionnaires began by simply asking clients to list the problems that they attributed to their tinnitus . Several questionnaires like Tinnitus Handicap Questionnaire (THQ), Tinnitus Reaction Questionnaire (TRQ), Tinnitus Handicap Inventory (THI), Tinnitus Questionnaire, The Tinnitus Functional Index (TFI0 and The Tinnitus Primary Function questionnaire (TPFQ) are designed to evaluate how tinnitus affects the primary ways tinnitus impacts a person’s quality of life [7,10-12]. A new questionnaire Tinnitus Primary Function Questionnaire (TPFQ) was designed to specifically evaluate how tinnitus affects the primary ways impacts a person’s life. It focuses on the four areas (a) emotions, (b) hearing, (c) sleep and (d) concentration. The present study attempts to transadapt and standardize tinnitus primary function questionnaire in Hindi to evaluate the impact of tinnitus on quality of life of clients having tinnitus with and without hearing loss by using primary functions questionnaire (Hindi). A total of 50 participants (age range 20 to 70 years) (mean age: 41.4 and standard deviation of age: 13.4) were selected for the study based on the inclusion and exclusion criteria. All the participants having subjective, permanent and spontaneous unilateral or bilateral subjective idiopathic tinnitus with and without hearing loss were taken in the present study. The Participants who fulfilled the criteria for the study were selected and oral consent was present to the participants. They were instructed to read the questionnaire (self-questionnaire TPFQ-H) thoroughly and complete comfortably. Group-1: The group 1 consisted of 27 participants having tinnitus with hearing loss of age range 20 to 70 years. Group-2: The group 2 consisted of 23 participants having tinnitus with normal hearing of age range 20 to 70 years. Group-3: Group 3 was consisted of twenty normal participants and five participants with tinnitus and hearing loss (not included for statistical analysis). The suggestions given by these participants regarding the test material were included in the actual test material (for linguistic validation of developed transadapt TPFQ-H). 1. Participants having subjective unilateral or bilateral tinnitus. 3. Normal hearing and hearing impaired (Unilateral and bilateral hearing impaired) patients with tinnitus. 4. Minimum duration of tinnitus 3 months. 5. Participants should have knowledge of Hindi language. Participant with neurological, psychological & behavioural issues were excluded from the present study. All subjects were asked to Scoring based on likert scale ,the participant responds with scores one to five: fully agree (‘5’), mostly agree (‘4’), sometimes agree (‘3’), partially agree (‘2’) and fully disagree (‘1’). Stage 1: Transadptation of tinnitus primary function questionnaire in Hindi (By using standard Translationback- Translation method). Stage 2: Linguistics validation of feedback rating of the transadapt tinnitus primary function questionnaire. Stage 3: Administering the transadapted questionnaire (TPFQ-H & THQ-H) on participants with tinnitus (with hearing loss and without hearing loss) and obtained the test score. Stage 4: Validation of tinnitus primary function questionnaire in hindi. Stage 5: Checking the reliability of 12 questionnaire of hindi version of tinnitus primary function (TPFQ-H). In the first step Tinnitus Primary Function Questionnaire (TPFQ) English was translated in Hindi by ten native speakers of Hindi, with high level of proficiency in English and Hindi. In the second step of linguistic validation, reverse- translation from Hindi to English was done to check intactness of meaning by another ten native Hindi speakers with high level of proficiency in Hindi languages. Back translation of the transadpted Tinnitus Primary Function Questionnaire (TPFQ-H) to English was done to measure the homogeneity of the original version of Tinnitus Primary Function Questionnaire. Transadapt Tinnitus Primary Function Questionnaire was arranged accordingly. The transadapt TPF-H questionnaire consisted of 12 questions, which was divided into four sub-scales. The four sub-scales address four- important domains of negative impact of tinnitus: concentration, emotion, hearing, sleep. Transadapted TPFQ-H was provided to five native Hindi speakers who were Speech Language Pathologists (SLPs) and Audiologists, having at least two years of clinical experience for feedback rating and appropriateness of newly developed tool. The purpose of linguistic validation was to rule out dialectic variations, if any, in the questionnaire and incorporate appropriate suggestions of the professionals. It was noted that, similar findings emerged as during the Forward- Backward translation; no linguistic difficulty was reported by participating Audiologists and Speech and Language Pathologist. The Questionnaire (TPFQ-H) was administered on twenty normal participants having no history of hearing loss and tinnitus and five participant having tinnitus with hearing loss (group 3). (Ten Hindi speakers students of standard 10th, who has no idea about tinnitus and another 10 Hindi speaker student from BASLP and MASLP field who has concept of tinnitus). These participants were not included in the actual study. The suggestions given by these participants regarding the test material were included in the actual test material (for dialect variation & linguistic validation).Based on the pilot study time taken for the administration of the developed transadapted TPFQ-H was approximately 15-20 minutes. The developed transadapt TPFQ-H was given to all the participants of the present study for self-rating. The participants were prior informed that the transadapt TPFQ-H being administered for the purpose of research. They were briefed about the TPFQ-H questions. Participants were asked to read the questions carefully and Circle the appropriate rating in 1-5 rating scale. Each rating option was explained to all the participants with the help of few examples from day to day life. Any clarification requested by the participants was provided by the researcher. Time provided to each participant was 15-20 minutes for completing their rating. The total scores from Tinnitus Primary Functions- Hindi (12 items) version were significantly correlated with Tinnitus Handicap Questionnaire (THQ-H) for validation of TPF. The THQ-H presented to each subjects (50) one by one and scoring was based on likert scale (1-5 rating scales). Validity indicates that the test measures what it purports to measure. This is usually demonstrated by comparing it with a previously similar test. For example, the TFI was validated with the THI, which was in turn validated with the THQ . Reliability was checked through statistical analysis by using Cronbach’s alpha and Cronbach’s alpha was calculated for all 12 items. Scoring of the TPFQ based on 1 to 5 point likert scale, For each item on questionnaire, the participant responds with scores one to five: fully agree (‘5’), mostly agree (‘4’), sometimes agree (‘3’), partially agree (‘2’) and fully disagree (‘1’). The responses are summed up with a total score ranging from 1 to 5 points. Higher scores represented greater perceived difficulty. Severity of the problem could also found out based on 5 categories of scales (likertscale) calculated for the total TPFQ-H score. Another questionnaire Tinnitus Handicap Questionnaire (THQ-H) has 27 questions. All of them are divided into three factors: factor 1 (Behavioral, Social, and Emotional) and factor 2 (Hearing abilities), factor 3 (Perspective). Severity of the problem could also found out based on 5 categories of scales (likert-scale) calculated for the total THQ-H score. The obtained scores of each participant were entered separately in terms of total TPFQ-H and its four subscale i.e., (a) concentration (b) emotions (c) hearing, and (c) sleep in Statistical Package for Social Sciences (SPSSv- 20.0) system and analysed by using Pearson correlation, Cronbach’s alpha and Parametric (Independent) t-test. Mean and standard deviation of total TPFQ-H and its four subscales were calculated. The English version of the questionnaire transadapt into Hindi was administered in group of Hindi speaking individual with tinnitus. Tinnitus Handicap Questionnaire Hindi version administered on same group for correlation and validation of questionnaire . Both questionnaires were administered to the same subjects one by one and the total score from the two questionnaires was computed for correlation. It helps to measure the severity and negative impact of tinnitus with and without hearing loss. It also helps to measure the complex interference of tinnitus with psychological distress and quality of life. The Mean & Standard deviation and Pearson’s correlation, Cronbach’s alpha scores was found for TPFQ-H & THQ-H and its subscales. Table 1 show the overall mean score obtained on for TPFQ-H is 35.50 with SD 11.12 and for THQ-H 82.44 with SD 20.35 .Pearson product movement correlation was done to find out correlation between both the scales. The results indicate the correlation value of 0.729 with significance of 0.000 at the level 0.01 that showed Positive correlation between both questionnaires. Table 1. Total score of TPFQ-H & THQ-H, Mean & SD and Pearson’s correlation. The correlation between (Factor 1 & 2 and subscale of TPFQ-H) showed excellent correlation, significant at 0.01 levels & 0.05 levels (Positive correlation). Factor 3 and subscale 3 showed less correlation. Hence, both questionnaires can be used for clinical purpose (Table 2). Table 2. Correlation of TPFQ-H (subscales) with THQ-H (subscales). A high Cronbach’s alpha (i.e., above 0.7; Nunnally 1978) would suggest better internal consistency reliability for a particular questionnaire. Results revealed a high Cronbach’s alpha for 12-questionnaire; TPF-Hindi version demonstrates good reliability (Table 3). Hence, based on the above results it can be noted that there is significant correlation between both the scales and reliability between the scales is also good. Therefore both the scales can be used for finding out impact of tinnitus on individuals’ primary functions. However, the Tinnitus Primary Function Questionnaire was more sensitive to changes in tinnitus function. 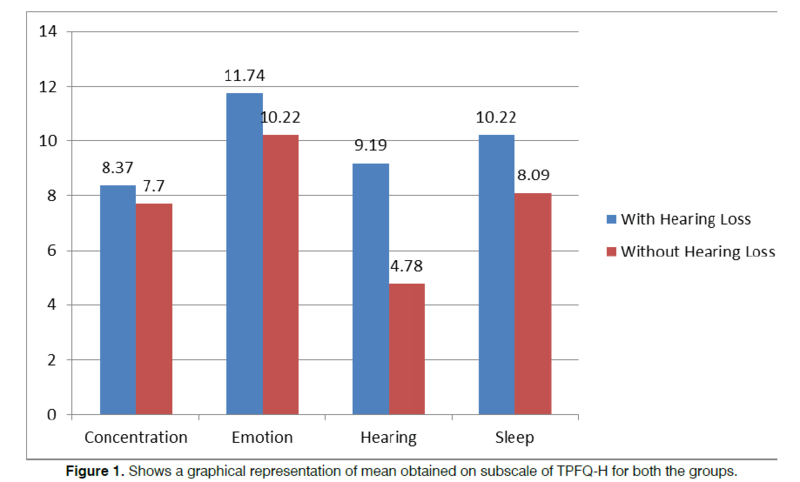 Table 4 and Figure 1 represents the obtained Mean & SD of TPF-H (Subscale: Concentration, Emotion, and Hearing & Sleep). The obtained mean and SD for concentration, with and without hearing loss were 8.37 & 7.70 and 3.8 & 3.8. For the emotional subscale, mean & SD for hearing loss and without hearing loss were 11.74 & 10.22 and 3.2 & 3.34. For the hearing subscale, for both subjects mean & SD were 9.19 & 4.78 and 3.3 & 2.5. For the sleep subscale, both subjects mean & SD were 10.22 & 8.09 and 3.9 & 3.9. Table 4. TPFQ-H subscale (Concentration, emotion, hearing, sleep) with and without hearing loss. Figure 1: Shows a graphical representation of mean obtained on subscale of TPFQ-H for both the groups. To find out significant difference between the means t -test was done and results indicate the t values for subscale concentration is 0.618 (0.540) for subscale emotion 1.623 (0.111) for subscale hearing 5.208 (0.000) and for subscale sleep 1.908 (0.062) indicating the only in subscale hearing there is significant difference among groups. However, it can be noted that on the other three subscales both the groups had same scores. Table 5 and Figure 2 represents the obtained Mean & SD of THQ-H (Subscale: Factor 1 (behavior, social & emotion), Factor 2 (hearing), Factor 3 (perspective) The obtained mean and SD for factor 1 with and without hearing loss were (53.41 & 43.35 and 12.74 & 10.44). For Factor 2, mean & SD for hearing loss and without hearing losses were 23.59 & 20.43 and 6.07 & 6.83). For Factor 3, for both subjects mean & SD were 11.37 & 11.70 and 3.6 & 3.9. Table 5. 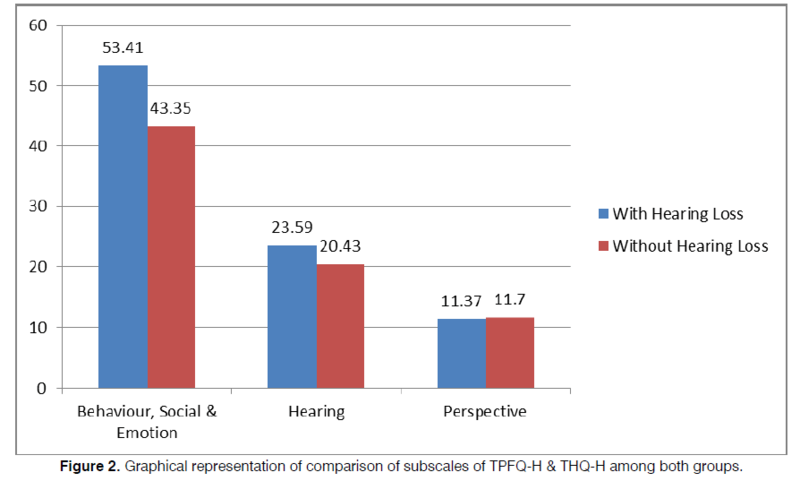 Mean and SD of THQ-H total and subscales of tinnitus with and without hearing loss. Figure 1: Brazilian Scale of Hearing and Language Development. To find out significant difference between the means paired “t” test was done and results indicate the t values for factor 1 is 3.018 (0.004) for factor 2 is 1.729 (0.090) for factor 3 is 0.305 (0.762) indicating the only factor 1 there is significant difference among groups. However, it can be noted that on the other two factors both the groups had similar scores. These findings suggest that among three subscales, factor 1 (behavior, social & emotion) indicates significant difference between the scores of subjects having tinnitus with hearing and subjects having tinnitus without hearing loss which shows that tinnitus effects social, behavior and emotional aspects of life. The present study focused on evaluating the reaction and impact of tinnitus with the self-reported questionnaire. Most of the instruments that evaluate the “quality of life” were developed in English and were intended to be used in English speaking countries. The study is needed to develop instruments to be used in countries where English is not a native language. Such questionnaires when used with the person having different language backgrounds will not yield exact result. There are very few questionnaire developed in Indian languages to assess negative impact due to tinnitus. The present study is an attempt to transadapt and standardizes Tinnitus Primary Function (TPFQ) in Hindi language. So it will help to provide an efficient and easy measure of negative impact related with tinnitus. To standardize Tinnitus Primary Function (TPFQ) in Hindi, reliability and validity of the H-TPFQ were thoroughly studied after the linguistic validation. The results indicated good correlation between score of TPFHindi and THQ-Hindi, High internal consistency among the twelve questionnaire of TPF-H and high correlation in test-retest reliability. To conclude, Tinnitus is a well-accepted issue that affects the overall Quality of Life of individuals with tinnitus. Literature has supported the need for assessing the Quality of Life in this population. Considering the need for having reliable questionnaires, questionnaires have been developed or translated in various languages. The English version of Tinnitus Primary Function Questionnaire (TFP) found to be more robust and reliable among them was selected for translation in Hindi language. Roy D, Chopra R. Tinnitus: An update. J R Soc Promot Health. 2002;122(1):21-3. McFadden D. Tinnitus: Facts, theories and treatments. Washington DC, National Academy Press, 1982. Liyanage SH, Singh A, Savundra P, Kalan A. Pulsatile tinnitus. J Laryngol Otol. 2006;120(02):93-7. Fowler EP. Head noises and deafness: Peripheral and central. Laryngoscope. 1939;49(10):1011-9. Lockwood AH, Salvi RJ, Burkard RF.Tinnitus. New England Journal of Medicine. 2002;347(12):904-10. Vernon JA, Meikle MB. Tinnitus masking: Unresolved problems. In CIBA foundation symposium. 1981;85:239-56. Meikle MB, Henry JA, Griest SE, Stewart BJ, Abrams HB, McArdle R, Folmer RL. The tinnitus functional index: Development of a new clinical measure for chronic, intrusive tinnitus. Ear Hear. 2012;33(2):153-76. Tyler RS. Tinnitus disability and handicap questionnaires. Semin Hear. 1993;14(04):377-83. Tyler RS, Baker LJ. Difficulties experienced by tinnitus sufferers. J Speech Hear Disord. 1983;48(2):150-4. Kuk FK, Tyler RS, Russell D, Jordan H. The psychometric properties of a tinnitus handicap questionnaire. Ear Hear. 1990;11(6):434-45. Wilson PH, Henry J, Bowen M, Haralambous G. tinnitus reaction questionnaire psychometric of a measure of distress associated with tinnitus. J Speech Lang Hear Res. 1991;34(1):197-201. Newman CW, Jacobson GP, Spitzer JB. Development of the tinnitus handicap inventory. Arch Otolaryngol Head Neck Surg. 1996;122(2):143-8. Paper submitted to the ITJ-EM (Editorial Manager System) on March 31, 2018; and accepted on April 13, 2018. Citation: Shaurya C, Ravichandran A, Kumar S. Transadaptation and Standardization of Tinnitus Primary Function Questionnaire in Hindi. Int Tinnitus J. 2018;22(1):23-29.